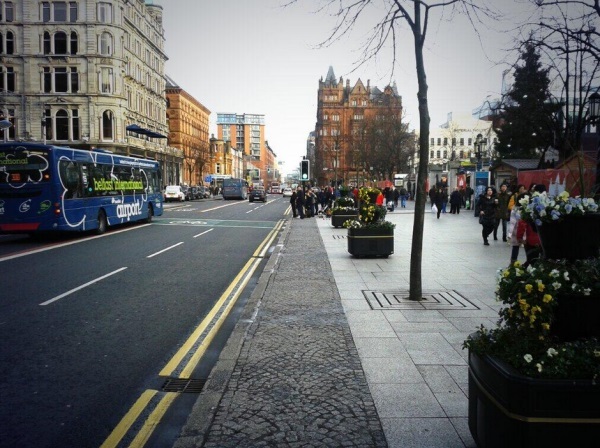 An iconic cycle track across the front of Belfast’s City Hall? At the central hub of the forthcoming city bike hire scheme? Bridging a cycle route between West Belfast and the River Lagan? Can’t for the life of me see where the space would come from. Our road planners remain very car-centred in their thinking. Maybe that will change with DRD’s new Cycling Unit. I hope so. 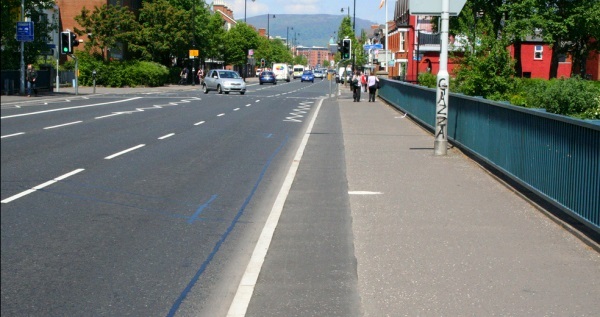 I’d like to think that the occasional engineer who understands cycling has been leaving love letters to the network that could be..
Belfast’s busiest cycling bridge is on the Ormeau Road, caught between the traffic-free National Cycle Network (at the pedestrian crossing pictured) and more off-road shared pavement to the south. But this ‘narrow road’ and ‘lack of space’ means no cycle path across the bridge. Sigh. What about the second busiest cycling road in the city, the East Bridge Street/Albert Bridge route. It’s a pity there’s no space to lay a safe cycle track here..
We’d be on to something here, except for the street dressing. 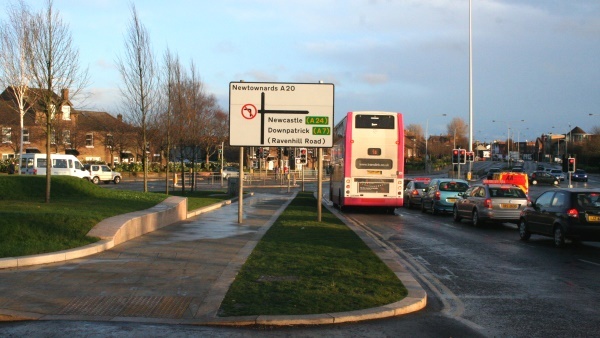 How do you balance the placement of three young trees against reduced congestion and improved safety and health outcomes for hundreds of Belfast residents? Still, there’s always urban regeneration money slushing about, if road planners can’t see the potential. Designing fancy new urban realms usually involves making liveable spaces, maybe even some sustainable transport considerations. Or just leaving a big heap of missed opportunity. 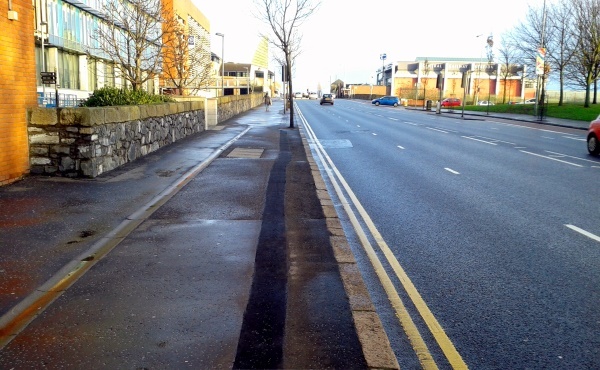 Everyone cycling in heavy rush hour traffic now stares longingly at the special dedicated grass lane to their left. Building a healthy city with a resilient sustainable transport network requires more wit and innovation than the Department for Social Development possesses. We’ll limp on with minimal progress in cycling infrastructure if we can’t look around and see the possibilities. Plenty of our main roads have adequate space for better facilities. Let’s start to imagine our arterial routes with better cycling space, and take bold steps when the opportunities crop up, or are sitting right under our noses.